There is truly no one on earth like actor/writer/director/underwear manufacturer Tommy Wiseau. His debut film, 2003's The Room, is largely considered to be one of the worst movies ever made, but its impossible and infinite charms have kept it screening at underground cinemas around the world on a regular basis. 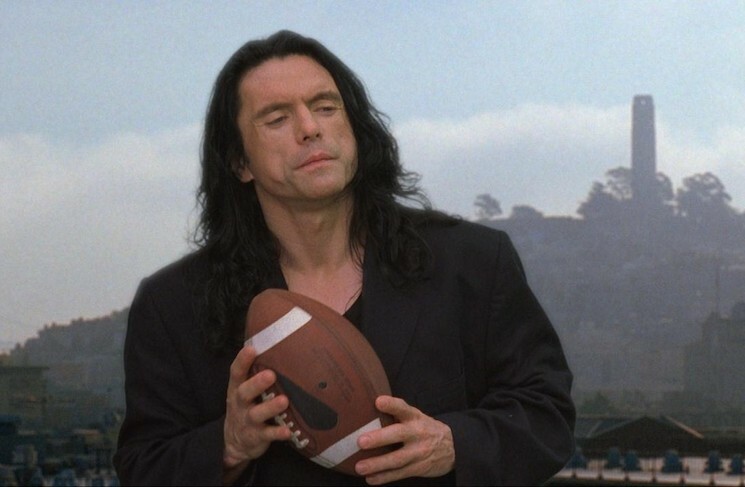 The Room's lead actor Greg Sistero wrote an in-depth (and truly hilarious) exposé of the film last year with his book The Disaster Artist, where he detailed the film's harrowing creation. Put simply, it was about as ridiculous and out of this world as you'd imagine. Wiseau's next big project sees him taking on the "sitcom" format (albeit in a distinctly weird Wiseau way) with a new show called The Neighbors. American fans can access the program through Hulu Plus, though Canadians will have to wait for Wiseau himself to bring it to Canada on tour. First up, The Room will be revisited with a multi-cinema screening through RiffTrax. The brain child of Mystery Science Theatre 3000 alumni Michael J. Nelson, Kevin Murphy and Bill Corbett, it sees them poking fun at Wiseau's disasterpiece live via sattelite while it screens in cinemas. The RiffTrax edition of The Room hits Canadian screens on May 6, and you can see the list of participating theatres here. All of these topics and more were on the table when we caught up with Tommy Wiseau for a 30-minute phone conversation. Among other things, he told us what he thinks about Greg Sistero's book, his involvement in James Franco's adaptation of said book, his plans to release the original 800-page novel on which The Room was based, the possibility of a Room sequel and how to break into the Hollywood big leagues. Keep in mind that Wiseau talks like an impassioned spambot in real life, but that's part of his charm so the transcript has only been lightly edited. Also keep in mind that every time he laughs, it sounds like this. Finally, it's worth noting that in conversation he's an incredibly polite and endearing man whose hard work has cemented him as an integral part of pop culture, if not for the reasons he originally intended. When will The Neighbors come out in Canada? We will be releasing in Canada because we will be screening what we call combo with The Room and The Neighbors. Eventually we'll be screening in Canada as well. Canada was I believe second country in the world to embrace The Room after UK. After UK, yeah. Of course the US was the first one, as you know. Have you spent much time in Canada? Yeah I've been in Canada already four times. Actually five times. So I really enjoy it. You guys have a cool environment as well. People are truly friendly. So I really enjoy it. What do you think of when you think about Canada? What I think about Canada you know it's a young country. Very vibrant country. You guys like a lot of American movies, as you know. And I think we're just, like, a little neighbours. That's what you are toward America. Except some culture is slightly different. Because you guys sit back, we are Yankees. Our lives go a little bit faster. But we enjoy your company as well. I always have a groovy time. You guys have good food and a unique culture as well, when I think about it. It's cool that we're your neighbours and your new show is called The Neighbors. There you go [laughs]. And as you know, we have an event in Canada on May 6 through RiffTrax. The Room will be screening in over 700 theatres across the world actually, Canada and the US, and hopefully you will enjoy it. It's slightly different than the way they usually show The Room. Can you explain to people, in your own words, what is RiffTrax? Well RiffTrax you know is a commentary about the movie at the same time movie is going. So you see on the big screen movie and at the same time commentary. And an imperfection or a laugh, et cetera, et cetera. Again it's nothing wrong, I'm always pro-freedom. I've been preaching to audiences the entire world, across the world, you can laugh, you can cry, you can express yourself but please don't hurt each other. So I think RiffTrax is a unique entertainment which is something different but some people enjoy it.